Craving a plate of fried food is normal. When eaten in moderation, fried food is a nice treat. After being deep-fried, the taste of the food is altered, and it usually becomes more delectable. Certain things you wouldn’t think of eating by itself become delicious and crispy after being fried correctly. This is why fried butter became a big hit in many fairs. When dipped in batter and deep fried in oil, other tempting food becomes simply irresistible and will lure even the most health-conscious person into taking a bite. State fairs don’t happen every day, making the best fried food inaccessible. Fast food restaurants, on the other hand, are open to satisfy your fried food cravings, but they aren’t the healthiest of options. Yes, deep-frying isn’t healthy, but it is better when you eat homemade fried food rather than relying on takeout, especially since you do not know what goes into the food you’re enjoying when it’s purchased elsewhere. 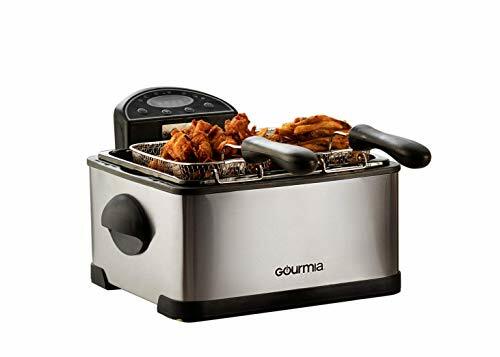 To give you a better fried food option this review will cover the Gourmia GDF500 Compact Electric Deep Fryer. Here you can learn more about its many features, the benefits you will get when using this fryer, as well as some of the cons you might encounter. When it comes to deep fryers, a constant dilemma of users is they do not have enough room to fry more than just one thing. This problem is address by the Gourmia GDF500 Compact Electric Deep Fryer, which has three differently sized baskets. The large basket can accommodate frying a large amount of one type of food while the two smaller baskets allow you to fry two different types of food at the same time. This is a big advantage for a home cook who wants to get their all deep-frying done in just one go. Another advantage of the Gourmia GDF500 Compact Electric Deep Fryer is that it is very easy to put together and it comes apart easily. This makes it simple to assemble when it arrives and also easy to take apart when it’s time cleanup. The temperature of this deep fryer is also a big plus because it stays consistent throughout the frying, no matter what you are cooking. It takes a few minutes for the oil for reach proper frying temperature, but once it reaches that temperature it is easy to maintain and you will be frying food like a professional fry cook. Another issue addressed by the Gourmia GDF500 Compact Electric Deep Fryer is the odor created while deep-frying. Anyone who has spent time frying food will know the struggle of taking the smell out of your hair, clothes, and kitchen. This can put many people off from deep-frying, but luckily this deep fryer has an odor reduction system which uses an activated carbon fry filter to keep the foul smell at a minimum. This makes deep-frying easy and more enjoyable especially since you don’t have to worry about smelling like cooking oil and grease while you eat! Just like with all deep fryers, the Gourmia GDF500 Compact Electric Deep Fryer can get really hot. The extreme temperature is necessary to fry your food properly. To avoid any accidents make sure that you use the fryer on a heat resistant countertop. Otherwise, the heat from the fryer can melt the surface you place it on top of. This particular deep fryer is also more expensive than other brands and models because it offers a lot more features. If you are not planning to use a fry a lot, you will be better off buying a more affordable unit. The Gourmia GDF500 Compact Electric Deep Fryer is also fairly big for a deep fryer at home. It can be difficult to store especially when you have a very limited space. Make sure to consider your storage options before deciding on which fryer to buy. Remember to read the instructions on how to use the unit before attempting to fry anything. This is a safety precaution to ensure you are using the deep fryer to its highest potential. Getting your hands on freshly fried food is made easier by the Gourmia GDF500 Compact Electric Deep Fryer. If budget is not an option, and you have ample space for storage, this is deep fryer you should look into. Save time by frying two different things at the same time using this deep fryer!